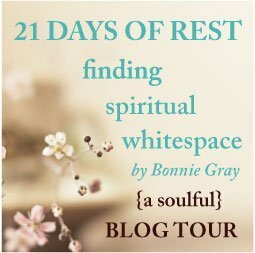 This post is part of the “Finding Spiritual Whitespace Blog Tour” which I am a part of, along with a group of soulful, journeying kindreds. To learn more and join us, CLICK HERE! That’s how I felt when I received Bonnie Gray’s book in the mail. I was doing so much and getting nowhere. Insomnia plagued me, and all I wanted was rest. Peace was something I hadn’t felt in months, but I was running on through each day. My mind riddled with thoughts and anxiously awaiting for something I had yet to give voice to. As I turned the pages of her story. I was so hungry. Hungry for rest. I was parched. So thirsty for peace. Running along and reading, and suddenly I hit the brakes and stood in awe at how God used the unlikely dark moments of her life, and the beautiful way He led her to the secret place of rest. Bonnie’s story became a God story as she accomplished “finding spiritual whitespace” and generously shared her experiences with you and me. Sharing her experience helps readers see that we can enter the secret place in plain sight. I’m honored to share the book that she says, “wouldn’t go away” with you. My prayer is you would dare to tell life that you are going to the secret place with God, and you will exhale as you read Bonnie’s book. You will wake up somewhere in the middle and breathe a sigh of relief when peace comes in like a flood. You can also enter to win a copy on my freebie page here.